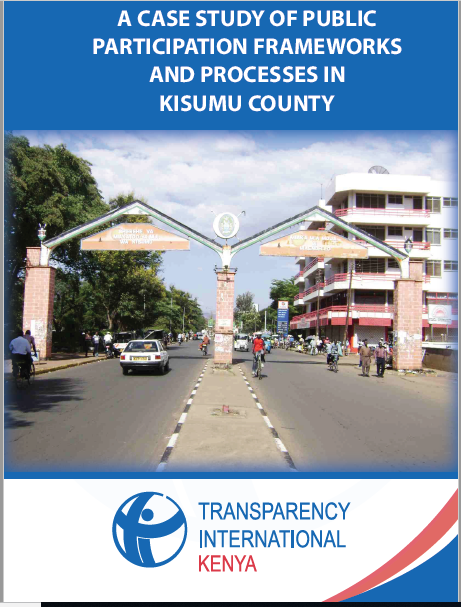 TI-Kenya has published A Case Study of Public Participation Frameworks and Processes in Kisumu County. The report comprises of feedback from stakeholders from Kisumu County drawn from the County Government, local residents and representatives of various CSOs and CBOs in Kisumu County on their assessment on the establishment and effectiveness of public participation frameworks and processes in the County. which provide for public participation. The assessment harnessed best practices on public participation in Kisumu County through a review of existing legal frameworks and guidelines on public participation at the national level. It also identified mechanisms and processes put in place by the Kisumu County Government towards promoting public participation and assessed on the level of local residents involvement in governance issues through public participation.